1. Wonder how you can end up with salsa, but no chips. 2. Remain calm, and remind yourself that the store is not that far away. 3. Remind yourself that you’re lazy and don’t want to waste the energy to drive all the way to the store as it would involve putting on shoes. 4. Try to find something as delicious as chips and salsa. 5. Realize that nothing is as good as chips and salsa, and try not to cry. 6. Preheat your oven to 350F. 7. Take the tortillas out of your pantry. 8. 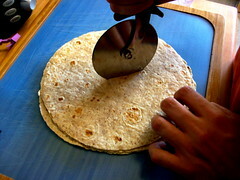 Use a pizza cutter to slice the tortillas into triangles. 9. 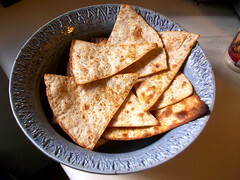 Brush the tortillas with a tiny bit of olive oil. Seriously, go easy on the stuff, you don’t want soggy chips. 10. 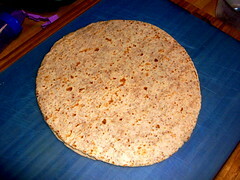 Season tortillas (cayenne, cumin, paprika, garlic salt…go nuts). 11. 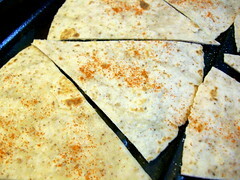 Place seasoned tortillas on a cookie sheet or broiler pan. 12. 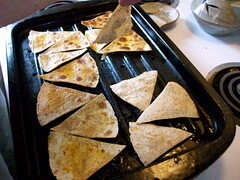 Bake for about 30 minutes, or until the tortillas are crunchy, flipping part way through. 13. 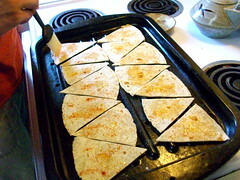 Remove tortilla chips from the pan and allow them to cool. Seriously, don’t burn your mouth. 14. Enjoy your chips and salsa and make a firm resolution to never run out of chips again. Next Next post: Copy Cats and Cheaters? Sort of.